Dr Ron Burke developed a personal interest in golf in the early 1990's, when he started to investigate how the biomechanics of the golf swing is effected by posture and back problems. 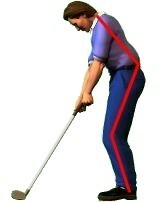 After much research into golf biomechanics he developed a system where he has categorised the seven major golf swing faults and their causes relating to posture, muscle and spine angle faults and resulting in the unique ChiroFit™ Program and Get Fit to Golf, which diagnoses your swing faults online and creates a tailor-made program to correct them and greatly improve a golfers swing and game. Get Fit to Golf is home of the ChiroFit™ Program - The Ultimate Golf Swing Analysis and Golf Swing Fitness Training Program that will Improve your Golf Game.